In the final part of Michael Seery's guest post on an introduction to nanoscience, we investigate the concept of nanophobia and look at nanoscience in Ireland. To read the previous parts click here and here. As with any new technology, there is always an unknown risk. It is the job of scientists to quantify this risk, and say whether it is significant. With my own students, I give them a chemical risk sheet for a "dangerous chemical" which says that it is toxic, and can cause all sorts of nasty diseases and problems. The chemical is sodium chloride - common salt. It is not dangerous to most people because the exposure is very low - but a small number of people need to consider this toxicity information, as they may be dealing with large quantities of it. Unfortunately this point is lost on a lot of media reports, and in truth scientists need to do a better job of getting a clear message out. Nanotechnology has enormous potential to do a lot of good for human kind, and indeed it is essential for technologies such as modern solar cells to work. There are recent reports that sunscreens, which contain nanoparticulate titanium dioxide or zinc oxide, which blocks out harmful UV radiation, are being sold as "Nanofree". The reason nanoparticles are included in sunscreens (and a lot of cosmetics) is that they are so small, they don't appear white, as they do in bulk form, so it is cosmetically advantageous to have a clear sunscreen than a milky white one. These have been tested, to show that they pose no danger, as the nanoparticles, although small, are too large to penetrate the dermal layer. However, this is lost on media, which unfortunately can often base articles on pseudo-science. There is an important job for scientists to do in quantifying any risk that may be involved, and then make a call on whether it is safe to use such materials. Ireland punches well above its weight in nano-research, given the size of the country (pun partly intended!) There are large research institutes in Trinity College Dublin - the CRANN centre and in UCC - the Tyndall Institute. In my own institution, DIT, we have the Focas Institute. My own research is based around nanoparticulate titanium dioxide, which is used as a self cleaning surface to kill off bacteria and other infectious material in hospital environments. The concept is that these materials are incorporated into paints and other surfaces in hospitals. They are continually activated by visible light from the room lights, which initiates reactions at the surface of the nanomaterial and and bacteria that are present, destroying the bacteria. 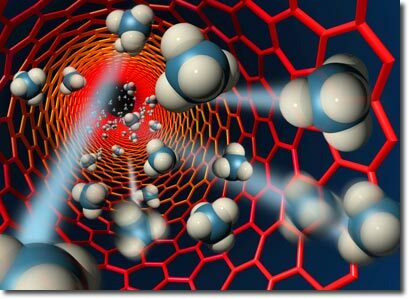 Nano Sense - http://nanosense.org/ A full suite of learning materials, including teacher and student materials, for introducing the topic of nanotechnology.